8lb danforth anchor, chain and line. (2) 13lb danforth anchors, chain and line. 3 life preservers, 2 throwable cushions. Cockpit mounted hand emergency pump, 3 Taylor "Big B" fenders, 2 Sopac flat rafting fenders. 4 dock lines, transom swim ladder, self-fraining anchor well w/hatch. Anchor roller on bow, 2 Lewmar self-tailing winches and 2 Lewmar regular winches, all spinnaker gear. Bulkhead compass w/lighting, built-in sliding chart table, VHF radio, stern rail mount antenna. Origo pressurless 2-burner alchohol stove on gimbals. Stainless rail mounted charcoal grill, holding tank with Y-valve.All Bahamas and FL keys charts, Dinghy, 45watt 3 amp solar panel, galley is stocked (dishes and Cutlery)misc tools,inverter battery charger, shore power cable with adapter,fish/depth sounder. 5hp 4 stroke outboard. TRAILER INCLUDED. Main: Original Tasker with 2 reefs, added shelf foot, Hild Racing with 1 reef. Mylar/Dacron Hild Racing jib and Myar/Dacron blade Hild Racing jib. Spinnaker, Hild Racing. 2 spinnakers from E22's for cruising. 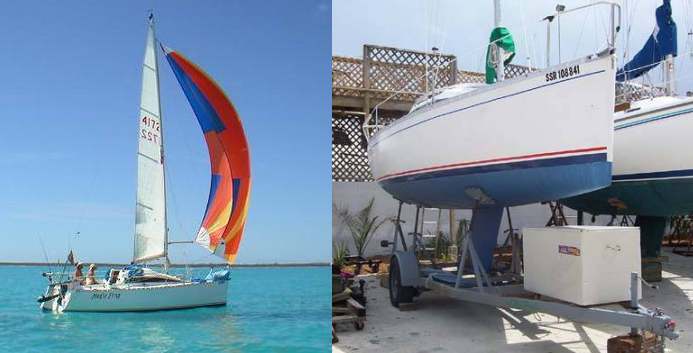 1988: Replaced the original plastic sink w/stainless steel sink, replaced original bladder water tank w/soli polyethylene tank, replaced original mainsheet blocks w/Schaefer, replaaced original backstay adjuster blocks w/Harken. 1990: Beefed up rudder gudgeons and babystay attachment from original styles. 1994: Replaced spinnaker foreguy & toppinglift cleats. 1996: Replaced original 1/8: lifelines with 1/4" lifelines. 2000: Replaced original 4HP Johnson outboard w/5HP Nissan 4-stroke. 2001: Replaced original fixed spinnaker mast fitting with track & sliding fitting. 2002: Replaced halyards, jib sheets, spinnaker sheets, main sheet. Kelly - wanna merge this other shot of MF into your duo pic? And here is the latest from the owner.... Magic Frog is now in NH! My name's Geoff and I have a 235 in Portsmouth New Hampshire. I have sailed close to 3000 Nm including 2 seasons in the Bahamas and a trip along the north coast of Cuba. The boat is ready for singlehanded cruising and since I have towed it from Newport RI to Florida and back. I would not mind at quick delivery to Canada. E-mail me on: Magicfrog2@hotmail.com if you are interrested. thats a great deal with the truck......activly looking for a buyer! so what's holding you up? you gonna live forever? scratch that itchy spot. do it in August so you can do the LOCCR & get spanked by me!